InfozechThought LeadershipUncategorizedHow retrospective billing can help telecom companies in identifying non-realized revenue? In the midst of various significant billing challenges faced by tower industry, Retrospective Billing gives a sigh of relief by resolving the challenge of acknowledging dynamic changes that occurs intermittently at tower sites, and are significant parameters for accurate billing. With the acumen and expertise in billing processes of Tower Industry, Infozech offers its dedicated and customizable automated billing product – iBill that encapsulates diverse features, with Retrospective billing added as an icing on the cake, resolving most of Tower Industry billing apprehensions. From our deep dive analysis, we identified that 3%-5% of the total billed sites certainly needs retrospective billing to realize the actual and correct billing. This amounts to almost 300- 500 sites that calls for retrospective billing. From the study of 10,000 sites, we concluded that on an average, the corresponding retrospective amount sums up to nearly $ 350,000 yearly. This revenue, at times, remains un-realized or becomes a prey to manual errors in the absence of retrospective billing, directly impacting the top line and bottom line figures of the company. Why Infozech’s iBill is the choice of one of the largest tower company? Saved $2 Million yearly with Infozech’s Tower Billing Solution across 3 Countries. Since, accuracy and precision in billing is highly imperative and our product – iBill is designed in a way that it possesses high-end, faster and accurate billing process. With the inception of automated retrospective billing, the utility of the product for Tower Company has increased manifold times as it will certainly impact every group in business chain. 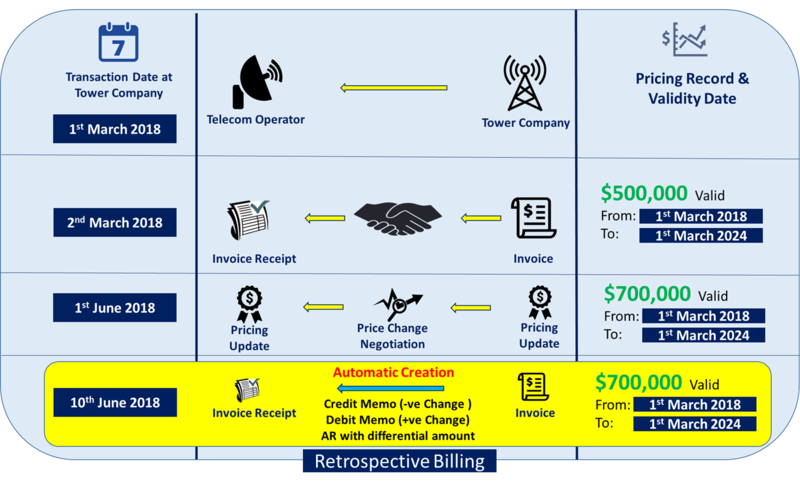 Why there is a need to automate Retrospective Billing process? Tower Company charges its customers, which are mainly Telecom Operators, for the services it provides at various tower sites. The rental billing is generally done in advance for the specific duration, generally on monthly basis. Since, the billing is done on historical data, it is needless to mention that any Site level changes, happening in the duration for which advance bill is generated, are recorded for billing and have to be billed subsequently in next billing cycle. This type of billing where a site is re-billed for the changes happened in past is generally termed as Retrospective Bill, back bill or supplementary bill. Currently, this billing is done manually and results in lot of discrepancies due to manual errors and un-validated bills shared with Customers. Need of Retrospective billing arises in various exhaustive scenarios that needs to be acknowledged and catered in smarter and efficient manner. Additionally, at Infozech, we have identified the impact of retrospective billing on Tower Company’s revenue. Why automating business processes needs an organizational mind-set shift from viewing technological solutions as merely a future goal of current core business strategy? Gone are the days when a strategic move by a company gets executed in a 5 year plan. Today, any business transformation is defined and is executed with intend of quick outcome. Hence, it entails that company’s business executives initiate and broaden their outlook, while automating business processes. Infozech’s automated Infrastructure and Energy billing solution -iBill not only catalyzes future revenue goals but also showcase significant upward trend in Top Line since its initiation, Retrospective billing, being one of the key contributor in making it possible.